Among the few truly experimental composers in our cultural history, Harry Partch's life (1901-1974) and music embody most completely the quintessential American rootlessness, isolation, pre-civilized cult of experience, and dichotomy of practical invention and transcendental visions. Having lived mostly in the remote deserts of Arizona and New Mexico with no access to formal training, Partch naturally created theatrical ritualistic works incorporating Indian chants, Japanese kabuki and Noh, Polynesian microtones, Balinese gamelan, Greek tragedy, dance, mime, and sardonic commentary on Hollywood and commercial pop music of modern civilization. 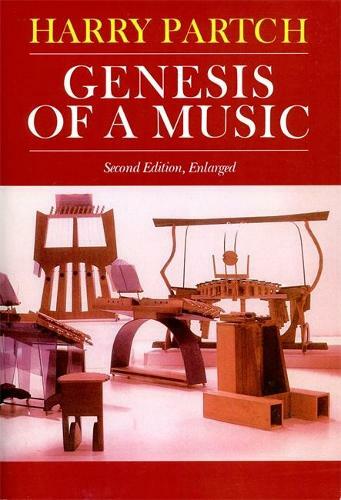 First published in 1949, Genesis of a Music is the manifesto of Partch's radical compositional practice and instruments (which owe nothing to the 300-year-old European tradition of Western music.) He contrasts Abstract and Corporeal music, proclaiming the latter as the vital, emotionally tactile form derived from the spoken word (like Greek, Chinese, Arabic, and Indian musics) and surveys the history of world music at length from this perspective. Parts II, III, and IV explain Partch's theories of scales, intonation, and instrument construction with copious acoustical and mathematical documentation. Anyone with a musically creative attitude, whether or not familiar with traditional music theory, will find this book revelatory. "Microtonality is an essential part of music, though European theories of harmony and tonality have nothing to say about it. Harry Partch's Genesis of a Music is therefore invaluable, dealing as it does in detail with the composer's inventions of microtonal musical instruments and his compositional method using a 43-tone scale."